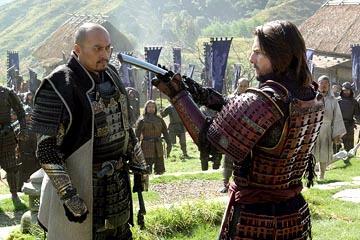 Tom Cruise has done something monumentally funny with The Last Samurai. As a bona fide superstar, he can pretty much do whatever he wants to, and people will come to watch, no matter how esoteric the material. American audiences are notorious for their laziness. Why watch something new and original when they can watch the same story over and over, just with different actors? Why think when one can sit back and let sensory overload take over? Why read subtitles? Well, over half of the dialogue in The Last Samurai is in Japanese, requiring lazy audiences to invest a little more in their moviegoing experience. It's good because it opens their mind a little more, and is true to the story. After all, why would all the Japanese people in 1870s Japan be speaking English, or worse, English with Japanese accents? This detail, and many others like it, lend a touch of authenticity to the film, giving it an epic, historical feel. This larger-than-life feeling soon wavers due to some simplistic characterizations, yet overall The Last Samurai is an enjoyable film. The Samurai in question is Katsumoto (Ken Watanabe, Genji: A Thousand-Year Love, Space Travelers), who is leading a rebellion against the Emperor. The film takes place during the Meiji Restoration, when Japan decided that it wanted to move into the present by modernizing rapidly. Katsumoto, whose family protected the emperor for years, was also one of the Emperor's advisors, and believed that this modernization was happening too quickly. He was rebelling because he believed it was his duty to do so. Part of what the Emperor wanted was a modern army. Enter Captain Nathan Algren (Cruise, Minority Report, Vanilla Sky), a Civil War veteran lost in drink, racked with guilt over the atrocities he committed on Native Americans. Mr. Omura (Masato Harada) wants Algren to come to Japan to teach train the Japanese army and Algren agrees only because the pay is excellent. Once there, he learns that one of his first missions will be to quash the rebellion. Omura also owns the railroads, and this rebellion is bad for his business. Against Algren's judgment, he demands that the army engage the Samurai in battle. After all, how well can a bunch of guys with swords and arrows fare against guns? Better than expected, because the Samurai win and capture Algren. The Last Samurai is two films; a pseudo-martial arts action film and a subtler, thinking film. It is the latter that is much more interesting, and deals a lot with the concept of bushido, the code of the Samurai. It is a set of behaviors rooted in honor and respect. This total commitment attracts Algren, and he finds himself fascinated with their culture. Screenwriters John Logan (Sinbad, Star Trek: Nemesis), Marshall Herskovitz, and co-writer and director Edward Zwick (The Siege, Courage Under Fire) create Algren and Katsumoto such that they are brothers; believers in the act of war. The specifics of one culture perplexes the other, but deep down, Algren respects the devotion the samurai have. He is their prisoner, yet is left alone to do whatever he wants. Katsumoto keeps him alive to gain a better perspective on how Westerners wage war. Soon, Algren finds himself, in essence, becoming one of them. He trains, and eventually goes into battle with the Samurai against his old allies. Which calls into question one of the more annoying aspects of The Last Samurai and other movies about foreign cultures. For whatever reason, probably demographics, there is always a white person, usually a man, at the center of the story. The most bizarre assertion that Zwick makes is comparing the Samurai rebellion to the United States' treatment of Native Americans. It was probably done to give a small amount of context, but is still really stupid. 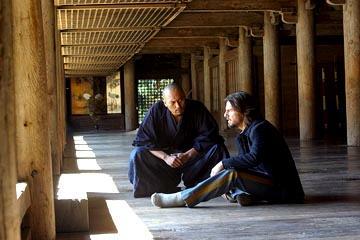 Cruise does not give his best performance, although the scenes where he slowly recovers from the vicious beat-down by the Samurai does give him the chance to act a little more than he often does. What is ridiculous is that over the span of a couple of months, he can master sword fighting to the point where he can defeat Samurai who have trained for all their lives. Earning their respect is one thing, besting them is another. Cruise's character is not even the most interesting. Watanabe's performance is much better. His devotion to the Emperor is absolute, as is his belief in bushido, which reconciles his paradoxical actions. Katsumoto is a thoughtful man, who knows what he's doing and why he's doing it, and will not falter if his actions lead to violence. Most other characters are stock characters. Koyuki (Alive, Laundry) is the eventual love interest. She tended to Algren while he recuperated, although he killed her husband. Omura and Algren's superior officer (Tony Goldwyn, Abandon, Joshua) are flat bad guys, who do little more than sneer. Zwick seems to want to make his movie more cerebral than it actually is. Yet, it is still about something, which is rare today. He tries pretty hard, but it never fully materializes. Better is his imagining of two battles that bookend the film. When the Samurai first appear, they seem to materialize out of the mist, with their silhouettes monster-like with their armor. The final battle, where Algren fights for the Samurai, is a spectacularly filmed piece of work, with what looks like hundreds of extras on both sides, the Samurai and the Japanese army, fighting a lop-sided battle of the past against the future. It's a magnificent lost cause, and the Samurai know this, yet they are doing what they believe in. The battle lasts quite a long time but loses steam when it's clear the movie is beginning the ending sequences. Zwick here is also doing what he believes in, but his instincts don't always fit with the story, or with logic. Even with this ending, the ending sequence is such a spectacle that it makes The Last Samurai enjoyable on a more superficial level. 2 hours, 24 minutes, English and Japanese with English subtitles, Rated R for violence.